The AMP Reading System is a groundbreaking, complete reading intervention system for striving middle and high school students reading at a third- to sixth-grade level. 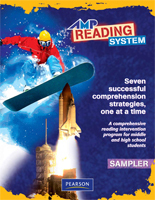 Based primarily on the findings of the National Reading Panel report from 2000, the AMP Reading System focuses on the seven strategies that are proven to have the greatest effect on students' reading skills - one strategy at a time! To learn about program configurations and learn what is the best option for you, select Purchasing Information from the left menu.